Decorative on one side, useful on the other… this is a room divider with a split personality! Prepare screen by removing hinges; set aside. Spray paint screen frames with ColorMaster™ Primer, on all sides. Spray paint primed frames with ColorMaster™ Gloss Ivy Leaf, on all sides. Spray paint one hardboard panel with Chalkboard Paint. Condition as indicated by manufacturer’s instructions. Set panel aside. Cut 2 pieces of batting to the same size of hardboard panels. Use hot glue to adhere batting to front side of two panels. For the French style bulletin board panel, cut canvas the height of the panel plus 6” x the width of the panel plus 6”. Lay canvas over batting, adhere in place by wrapping to backside and securing with hot glue. Set panel aside. For the pleated pocket panel, cut canvas panel 10’ x width of the panel plus 6”. For pockets 4” deep and 5 ¾” apart, measure 9” from top of panel; mark very lightly with pencil or straight pins. Measure 22 ½” from top of canvas panel; crease. Fold that crease up to the 9” mark. From the top of the first pocket, measure down 13 ½” and fold up to create a 4” pocket. Continue down the panel, measuring and creasing until you have 6-9 pockets, leaving the bottom 18” without pockets. With sewing machine and thread, top-stitch the top of each pocket. Position pocketed panel onto the batting covered panel; wrap 3” of canvas to the backside of panel and carefully hot-glue in place. With freezer paper and die-cut machine cut stencil for large needle and spool. With dry iron, press stencils in place on panels. Protect all areas not to be painted with masking paper and tape. Spray paint stencils with ColorMaster™ Satin Leather Brown; allow to dry. Lay the three panels side by side, leaving the same space between them as the frame will make. 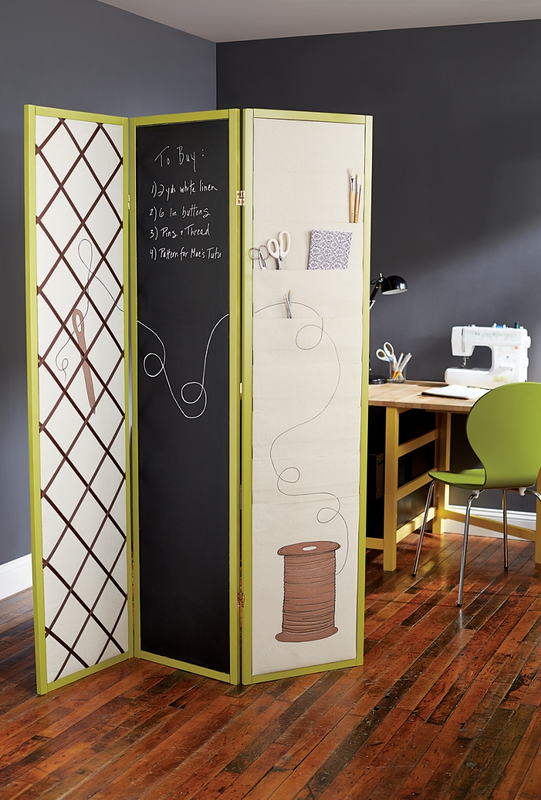 Draw thread on spool, across panels and through needle with Short Cuts® Paint Pens in Black and White. To finish the French bulletin board panel, lightly mark with pencil 9” increments down both sides. Criss-cross lengths of ribbon from each of these marks; pin to secure. Trim ribbon, leaving 2” to wrap to the backside of panel. Flip whole panel over and secure ends of ribbon with hot glue. Secure panels into their section of the frame with hot-glue on the backside of panel.